Where Can You Find the Best Smoky Mountain Views? If you take your smartphone with your everywhere as many of us do, you’re always wondering where the best snapshot can be taken from. In the Smoky Mountains, breathtaking views are at every turn. We have compiled a shortlist of some of the best Smoky Mountain views that can be found here right in Gatlinburg! This list is tailored to our non-hikers who still want to enjoy the mountain range from a great vantage point! Ride to the top of the mountain on the aerial tram at Ober ski resort. Even if you don’t plan to ski, the ride to the top will surely take your breath away! This 5 minute ride takes place in a glass aerial tram as it travels throughout the mountainside. For just a moment, you might think you are in the Swiss Alps! If you are adventurous, plan to ski or snowboard once you reach the top. If snow sports aren’t your forte, you can always ice skate or grab a bite to eat in the lodge! Grab a cup of hot chocolate, watch the skiers/snowboarders whiz by and enjoy the snow covered mountain! In the center of Gatlinburg, you can take a ride to the top of the Space Needle. Once you make it to the top, you will be presented with a 360 degree view of not only downtown Gatlinburg but the Smoky Mountains, as well! Spend a while at the top and enjoy the bird's eye view you will have from right here in downtown Gatlinburg. Be sure to bring your camera! This attraction is great for children and adults, as long as the patrons are not afraid of heights. These are only a few of the best spots to capture the Smoky Mountains! For more information, visit our website. 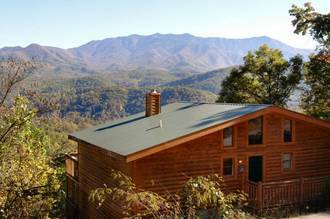 Book your stay and experience all of the best views found right here in Gatlinburg, Tennessee!